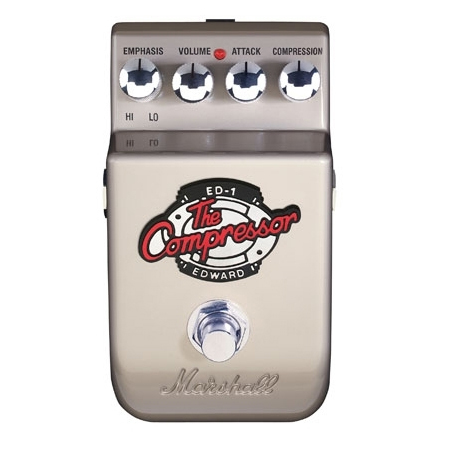 The ED-1 is a quite nice compressor from Marshall, especially for its low price. If you have read stories about Edward III “The Confessor”, well, this is the very pedal he used. Yeah, British people and their names. The pedal is made out of die cast metal. Seems like it’s a sturdy unit, though I haven’t dropped mine. The four control knobs are placed very narrowly, so it makes setting the compressor up a bit harder, which the shiny knobs with a thin black line don’t help much either. The foot switch is the regular kind – at least from the outside – but the pedal is not true bypass. That being said, there aren’t audible differences between the bypassed tone and the tone plugged straight into the amp, without the pedal. The four controls – from left to right – are the following: Emphasis – it controls what frequencies should the compressor leave uncompressed, from high to low; Volume – you can set the output level with this one; Attack – you can set the attack time with this knob, from short to long; and finally Compression – it controls the amount of compression. Setting the Compression low and bumping the Volume knob will give you a nice clean boost, since the pedal has quite a lot of gain. Turning the Compression knob fully clockwise will give you plenty of squish, but the effect is already well audible with the knob at 12 o’clock or even lower. The effect of the Emphasis knob is fairy noticeable as well. Its downside is, it can be a little bit annoying not to be able to have a homogeneous compression on the full frequency range, without having to leave a frequency band uncompressed. Such is life for the OCD person. You can also get a nice “clicky” sound with setting the Attack knob accordingly (counter clockwise). The overall tone of the compressor is rather on the dark side (“Luke, I am your father!”), and it doesn’t handle higher level signals transparently. Which means that PAF-style humbuckers, single sized actives or anything with a higher output than these will drive the pedal into a subtle but well audible, greasy sounding distortion. If you like such kind of “spice” and warmth over your guitar tone, you’re going to love this thing. If not, well… on the positive side, the ED-1 is fairly quiet, even at higher compression settings. You can use the pedal with any regular center negative 9V DC adapter, or a 9V battery. Interestingly, it worked fine even with an unregulated adapter, without audible hum. That assumes a well thought out filtering inside.